Lima is the 2nd largest city in South America (after São Paulo) and it’s probably the most chaotic one as far as traffic is concerned. So why is public transport in Lima so chaotic? Mainly because there’s no underground and everything else is simply not very organized. So are you ready for an urban adventure? 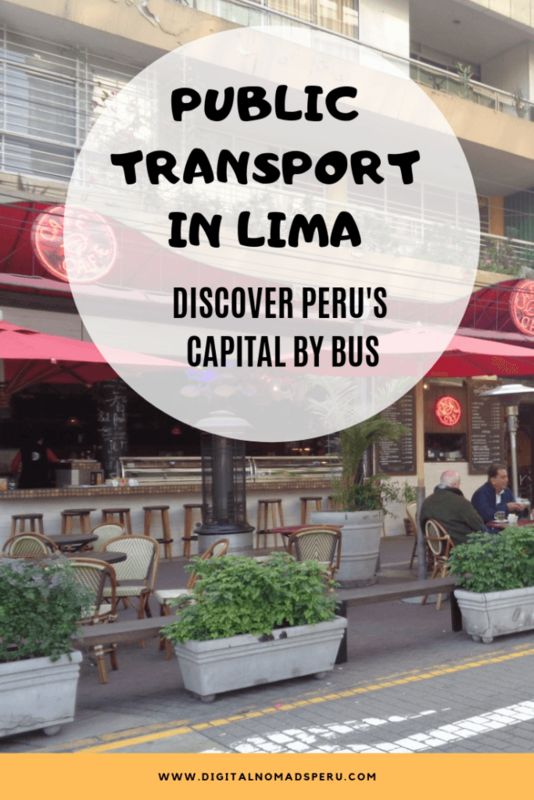 Here comes all you need to know about buses in Lima. 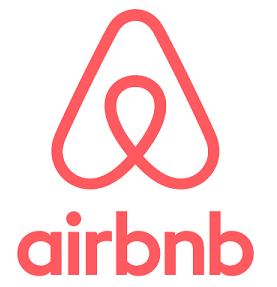 No, stop, first you have to make it from your airport to your accommodation. Until a couple of years ago, Lima airport transfer meant taking a taxi. Nowadays, there’s also a Lima airport bus to Miraflores (the neighbourhood where most tourists choose to stay). 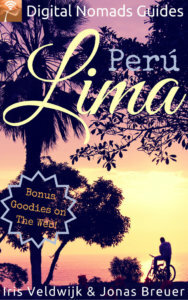 This guide gives you all the information needed for a soft landing in Peru’s capital. Don’t waste your time and money figuring out basic things. Lima’s international airport Jorge Chávez is situated in Callao. Unfortunately, Callao doesn’t have a good reputation so please don’t venture out of the airport with all your belongings in general and even less so when you arrive in the evening. 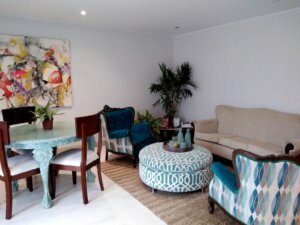 Is your accommodation in Miraflores or Barranco? Great! In this case, you can take the Airport Express Lima. It’s a blue bus with functioning wifi which stops at various locations in Miraflores. A one-way ticket costs US$8 or 25 Soles. If your accommodation is in Barranco, get off at LarcoMar. 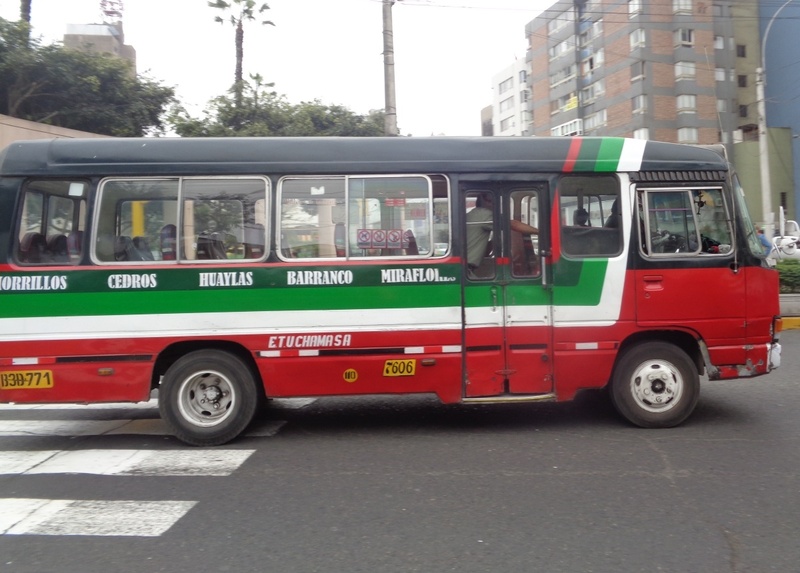 There’ll be taxis waiting, the ride to Barranco will cost you 6 – 8 soles. Negotiate the price before you get into the taxi. You can buy your ticket for the airport bus at the airport or on the bus. The Airport Express Lima counter is on the left side before you leave the passengers-only area after an international flight. Once you’ve left that area, you’ll have to make your way through all those taxi drivers who will try to sell you their services. Head to the exit, turn right, cross the street and head slightly right again. You will either see the blue bus from a distance or there’s a sign which marks the bus stop. 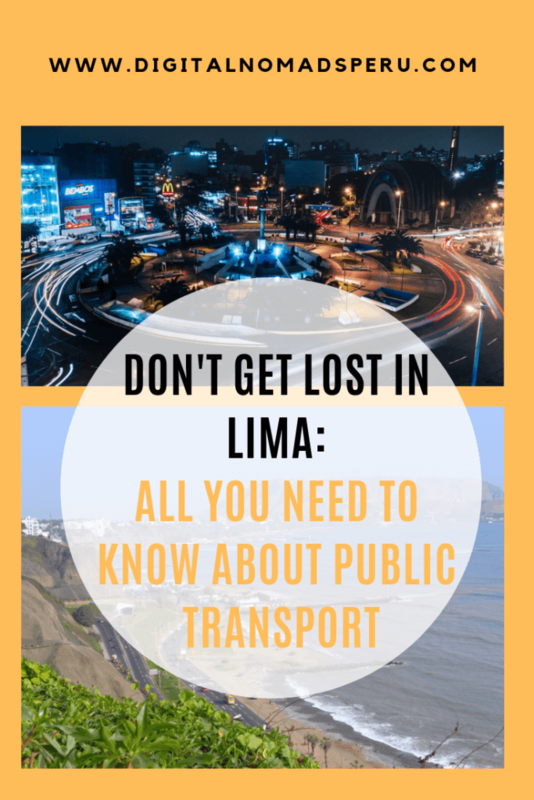 Getting around in Lima can be intimidating when you come from a Western country and the buses are the most chaotic but also the cheapest means of transport. They’re privately owned and take you everywhere but the routes are not always clear. However, it’s normally written on the buses which streets they will pass and the driver’s assistant also shouts it out at every stop. There are normal buses (well, more or less normal as they are usually quite old and often not well maintained) and so-called micros. If possible, take a normal bus as the micros stop everywhere and sometimes wait for enough passengers before they move on. I also find it a bit harder to get off a micro sometimes as there’s just one door. A bus ride shouldn’t cost you more than 3 soles and that’s a long ride. I often take the bus from Barranco to Miraflores and that costs 1 sol. It’s best when you have coins with you and always insist on being given the little ticket – as a receipt but also for insurance purposes. Expect bus drivers in Lima to drive as if they were on the quest to committing suicide. They won’t give you much time to get off, either. There are not always bus stops, so shouting “baja” when you see that your destination is close, is sometimes the best way to get off the bus. On the upside, they will often allow you to get off between official stops (paraderos). Use Moovit to find out how to get somewhere and how long it will more or less take. Metropolitano is a rapid bus system which crosses Lima from the south to the north and vice-versa. It’s your best bet if you live more or less close to one of the stops. 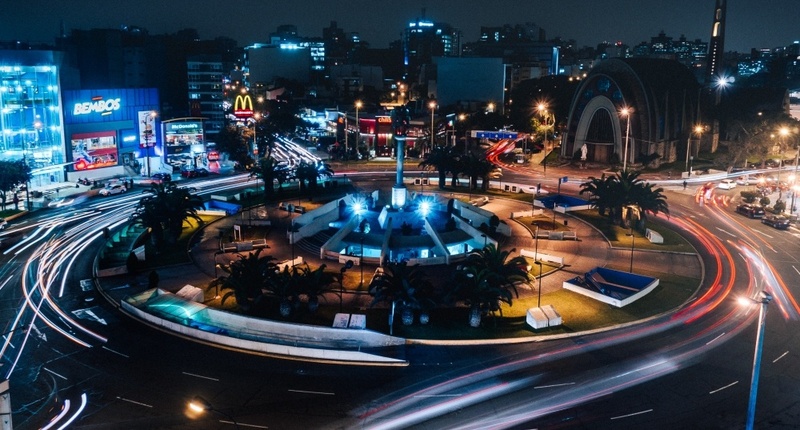 The closest stop to Parque Kennedy in Miraflores is Ricardo Palma. Metropolitano will take you to the Historic City Centre. Get off at Jirón de la Unión and walk about 5 minutes to Plaza de Armas, the main square. Metropolitano has express buses which don’t stop everywhere, so make sure you hop on the right bus. Don’t hesitate to ask employees or other passengers when you’re not sure. Before you can use the Metropolitano buses, you need to purchase a rechargeable card which currently costs 5 Soles. Every journey will cost you 2.5 Soles. Android App: Metropolitano (tells you about the routes, the times and where you can recharge your card) – nice to have but not absolutely necessary as Metropolitano is pretty easy to use. Hey, you mentioned above that there is no metro!! Correct and chances are that you will won’t even get close to Metro Lima, also known as the “Tren Eletrico”. Some 30 years ago, the Peruvian government decided that it was time for Lima to get a metro. They even got started. However, corruption, a new government and other obstacles came around and 20 years later, there was no sign of a metro yet. However, since 2012, Lima has the first half of its first Metro line. 5 more lines are planned, so do your maths and tell me when they might be finished and in operation. Line 1 connects some of the neighbourhoods east of Miraflores and Barranco with the city centre, so it’s not very likely that you will ever use it. Personally, I’ve never had any issues but people do get robbed or pickpocketed on buses. Make sure to watch your belongings all the time and keep your bags close to your body. This is especially important during rush hour when there are lots of people on the bus. Avoid sitting close to the doors. There have been incidents of people jumping in, grabbing a backpack or bag and immediately jumping out again. Do you have any more questions about public transport in Lima? What are your experiences? Don’t be shy and share in the comments!